Damien McGrane. Picture: Fran Caffrey / www.golffile.ieDamien McGrane won’t forget the eighth hole at Tseleevo Golf and Polo Club in a hurry after racking up a septuple bogey 12 there in the first round of the M2M Russian Open. The Kells man was two over for his round with two to play when he came unstuck at the water-protected 564-yard par-five and had to birdie the last just to shoot 80. Simon Dyson ©Getty ImagesHe wasn’t the only player to find disaster on the hole with Michael Hoey plummeting from the early lead on five under to joint 14th when he made a double bogey seven at the hole. Out in one under, Hoey birdied the first four holes on his back nine but then bogeyed the par-three sixth before losing two more shots at his penultimate hole in a two under 70. David Higgins is tied for 25th after a 71 alongside Gareth Shaw, who also made a double bogey seven at his penultimate hole, the 17th. But it was a disappointing day for Rathmore’s Alan Dunbar as he dropped three shots in his last six holes for a 75. Damien McGrane went down to David Horsey in sudden death but earned enough in the M2M Russian Open to secure his tour card for 2015. Damien McGrane, picutred in Spain earlier this season, got off to a positive start in Madeira. Picture by Eoin Clarke www.golffile.ieDamien McGrane prpdocued one of his trademark scrambling perforrmances to open with a one under 71 in the Madeira Islands Open – Portugal – BPI. 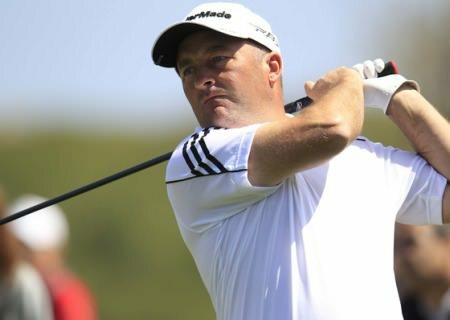 Damien McGrane in action in the third round of the Lyoness Open in Austria. 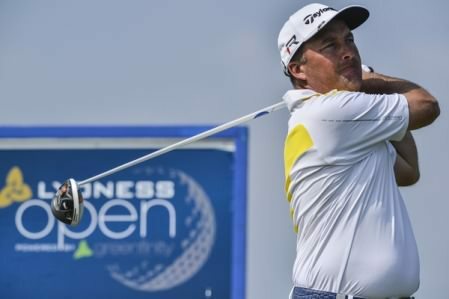 Picture: Jos Linckens / www.golffile.ieDamien McGrane made a positive move up the leaderboard but it was a day to forget for Gareth Maybin and David Higgins in the Lyoness Open powered by Greenfinity. Hoey in the mix despite "silly mistakes"
Michael Hoey is in contention in Moscow. icture: Thos Caffrey / www.golffile.ieMichael Hoey insists he must cut out his “silly mistakes” if he’s to capture the M2M Russian Open and his fifth European Tour title. Michael Hoey receives a rifle salute from the traditional Russian Military after winning the M2M Russian Open at the Tseleevo Golf and Polo Club. Picture ©Getty Images Michael Hoey continued his amazing record as voracious finisher when he cruised to his fifth European Tour win with a commanding four-shot victory in the M2M Russian Open.